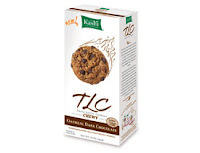 Have you tried Kashi cookies? I have and I LOVE them. Well, I should say that I love the Kashi Oatmeal Dark Chocolate cookie because that is the one I tried. They are a good-sized cookie and quite filling. It has yummy dark chocolate and the cookie is hearty oatmeal. Each cookie has 130 calories and 5 grams of fat, so it's a bit of a diet splurge if you're watching your weight, but the good part is that it is made with 7 whole grains and contains 3 grams of dietary fiber. If you want to try a FREE cookie for yourself, just sign up here. Thanks for visiting and entering my little giveaway! I really like your site and I'm on my way to get my free cookie ~ thanks for sharing that link!! Those look delicious. Thanks for entering my giveaway. Good luck!